I'm currently spending some time finding articles, publications and research on how ICT 'raises standards' and it's turning into quite a fascinating activity. This has sprung very much out of one of my last blogs about embedding ICT. In it I wrote about the need for a school to remember to ‘look back’ to evaluate what has been done in a school, what was successful or not, to learn from this before moving the whole school forward. Well I’m now doing the same thing. I’m looking for some clarity, reminding myself what benefits ICT does bring to the learner, the teacher and for the school. I’ve been doing this job for 10 years and I guess what I’m trying to do is de-construct what I believe I know about ICT and rebuild it on firmer foundations. The more I read this list, the clearer it becomes that you obviously don’t necessarily need to use ICT to develop any of these aspects. ICT can help, but so can other approaches. As an example, I watched my daughter over the Easter holidays carry out a geography Yr. 9 homework task. She had to come up with questions she wanted answering about Antarctica, carry out some research to find the answers and finally present this information back for her teacher. For about 6 days she worked for a couple of hours daily on this project. 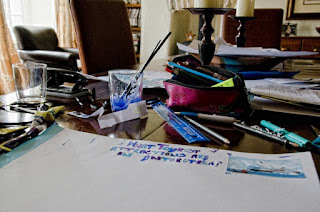 She sat the table with A3 sheets of paper, coloured pencils and paint, and put together an interesting and visually stunning presentation on Antarctica, with no sign of ICT. She was engaged, independent, highly motivated (no nagging from mum or dad! ), extremely creative, and was gathering and sharing information in an appropriate way. Not a computer in sight! The point I’m trying to make is that perhaps we (I’m) guilty of sometimes ‘over-egging’ the place of ICT in education. In my defence I have always talked about using ICT when it’s appropriate. For my daughter this was the most appropriate way for her to present her work. For her classmates it might have been completed on a leaflet, a poster, a video or on pieces of A4 paper in a folder. You can obviously be highly creative with ICT, however there are so many other ways in which some children will want to show their creativity. No matter what we would like to think, not all children will find ICT tools as the best way to demonstrate their creativity. It’s about us remembering to allow children the option to sometimes decide for themselves how they want to appropriately present their work. Painting, drawing, sculpture, dance, drama, playing an instrument or singing, writing stories and poetry are some ways in which children would like to demonstrate their creative talents. Dare I say....many of these are a lot cheaper to support and develop in a school than expensive ICT software or kit!! You'll Get What You've Always Got?